Whether you dream of escaping to your own tropical retreat or living full-time near the warm Gulf waters, you'll find it's worthy chasing the dream of Siesta Key. Real estate on this barrier island is dotted amid a landscape offering some of the most gorgeous scenery found in the U.S. However, the beach is by far the most popular amenity in Siesta Key. Condos deliver stunning views of the world-class beach which is truly unlike any other. Voted "One of the World's Best Beaches" by the Travel Channel, Crescent Beach (the main beach at Siesta Key) possesses some distinctive qualities. As you stroll along the shore, you're sure to notice the sand looks and feels quite different than that of other beaches. It's not the typical crushed shells or coral. This glistening, powdery-white sand is made of 99% genuine crystal-quartz. Confirmed by Harvard University's geology department, the quartz allows the sand to remain cool even on a scorching summer afternoon. Getting from the beach to your car or waterfront condo is always a leisurely walk rather than a mad dash. Search all Real Estate Listings for sale below or search by property type: Siesta Key condos | Siesta Key homes | Siesta Key land. Just imagine waking up to the gentle crashing of waves rather than a blaring alarm and finding that a gorgeous day awaits. What does the day hold? Anything you want! Living in maintenance-free bayfront or beachfront condos guarantees you'll have nothing on your "honey-do" list. Without the hassles of yard work or home upkeep, you're free to explore the key, make friends with a native dolphin, photograph exotic birds or just sit back and take in the show, compliments of Mother Nature. You may opt to rent your condo when it's not in use which will help offset expenses. Currently, prices for condos range from $200,000 to over $3,000,000. Houses in this area open the door to a lifestyle that's more attitude than routine. Everything about Siesta Key reflects relaxed, fine casual living at its best. As a pedestrian- and bicycle-friendly town, the island is easy to get around. With a quaint oceanfront village in the heart of the area, you can quickly find everything you're looking for. Meander through the "Village" and you'll encounter an abundance of sidewalk cafes, specialty restaurants, day spas, grocery stores, drugstores, florists and much more. But Siesta Key is more than shops, condos and homes for sale. It's also a fascinating source of natural beauty. With mild highs that range from 70 in the winter to 92 in summer, full-time, vacation and retired residents find the perfect setting for wildlife encounters in the wetlands and woodlands nearby. With inspiring views - including that of the Point of Rocks limestone formation - and excellent snorkeling, nature lovers have plenty to choose from. In addition, outdoor enthusiasts have access to all things water, including extensive boating opportunities, scuba diving, fishing and much more. If water is your passion, Siesta Key is meant for you. Surrounded by water with the Gulf of Mexico to the west and Sarasota Bay to the east, this area opens its arms wide to those who seek adventure on the waves. 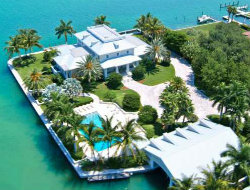 Boat lovers have many options with plenty of waterfront homes for sale directly on Sarasota Bay. Almost 50 miles of canals give you enormous possibilities. There are many options for your next waterfront home, including canal-front, bay-front, oceanfront and beachfront property in private neighborhoods, such as the Sanderling Club and Solymar. The north end of the island is considered by many to be the most desirable because of its prime location. You'll have quick and easy access to the mainland and downtown Sarasota. Homes for sale range from around $400,000 to over $8,000,000. Contact me today and I'll arrange a personal tour of any of the waterfront homes for sale you desire. We have been involved in home sales here for over 30 years. Find information on neighborhoods below. Looking for a home where you can walk to the Village and beach? For your convenience, we also set up a page exclusively with homes near the Siesta Key Village. With a population of about 12,000 full time residents and double that with snow birds and tourists, Siesta Key keeps busy throughout the year. Many of the residents live here to enjoy this charming, amicable and resplendent beach. Whether you live here year round or just visiting, everyone can indulge in water activities such as parasailing, snorkeling, jet skiing, boating, fishing, kayaking and many more. For those who want to shop or eat out, the Village offers an eclectic array of possibilities. This hotspot is lined with cafes, casual stores and even has live music. 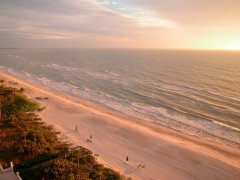 This barrier island has all of the amenities but with a carefree and laid back atmosphere. We help buyers from around the world who are interested Siesta Key properties. Complete the simple form at the bottom of the page to have one of our experienced and friendly agents contact you. We are here to help you with all of your real estate needs!